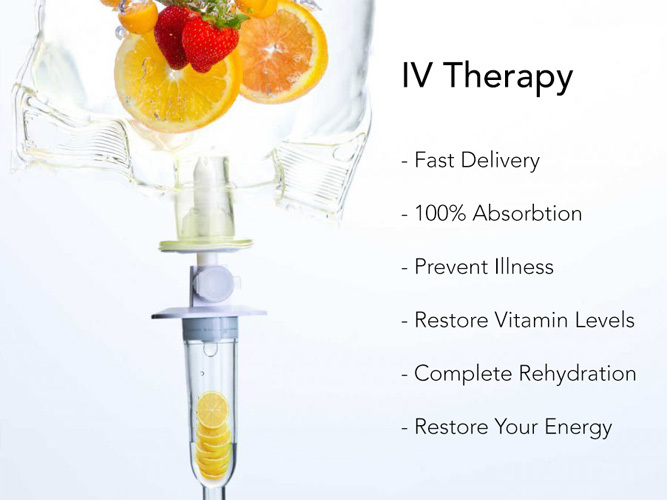 IV therapy delivers an immediate dose of vitamins, minerals, and antioxidants straight to your bloodstream to energize and rejuvenate you almost instantly. Dr. Jessica Cho administers IV therapy in the relaxing atmosphere of the procedure room at Wellness at Century City. Residents of the Los Angeles area benefit from the healing and health-boosting effects of IV therapy. You can call to make an appointment or book it online. Receiving vitamins and other nutrients through an IV delivers them directly to your bloodstream so your body can put them to work. They bypass the gastrointestinal tract, so they won’t cause any gastrointestinal problems sometimes associated with taking high doses of vitamins orally. An IV delivery also allows the vitamins to bypass the liver, which can alter many nutrients during metabolism. What conditions does IV vitamin therapy treat? If you experience chronic stress, ask Dr. Cho about the IV Executive Stress Formula. Those with a poorly-performing immune system, chronic fatigue syndrome, or Candida may benefit from the SuperImmune Boost Formula. Healthy men and women benefit from IV vitamin therapy, too, as a preventive treatment to ward off disease and infection. Why is IV therapy superior to oral vitamins? Only a fraction of orally-consumed vitamins is absorbed. Taking a higher dosage of oral vitamins to increase absorption doesn’t work because your small intestine can only absorb a certain amount of each vitamin at a time. High oral doses can leave your stomach irritated and sensitive. But with IV vitamin therapy, you get the entire dosage of vitamins and nutrients to benefit your wellbeing, without stomach discomfort. What happens during an IV therapy session? Dr. Cho consults with you prior to receiving IV vitamin therapy to assess what combination of nutrients she thinks will be most beneficial. You receive the nutrients through an IV inserted directly into your veins. The infusion lasts between 20 and 90 minutes, depending on the combination of nutrients needed. You can relax in the treatment room and listen to music during the infusion, and you can resume your normal daily activities immediately after receiving the IV. What is high-dose vitamin C therapy? Vitamin C is an antioxidant that helps prevent oxidative stress. Nobel Prize-winning chemist Linus Pauling studied high-dose vitamin C as a treatment for a variety of illnesses. Intravenous vitamin C results in much higher blood levels of the vitamin than high-dose oral therapy. High-dose vitamin C also helps with wound healing, assists in detoxification, and acts as an antioxidant and an anti-inflammatory. B Immunity Shot - B Complex with Vitamin C: Recommended to boost the immune system and increase energy. Fights infection. Benefits: Improved immune system, emotional well-being, better memory, increased energy, improved alertness, better sleep, improved skin quality and decreased stress. Lipotropic Shot: Methionine, Inositol, Choline (MICA): Recommended for fat burning weight loss. Benefits: Increased metabolism for weight loss, increased energy. Helps curb the craving of unhealthy foods, burns calories. B Lipotropic Shot Plus: Methionine, Inositol, Choline with Vit B12: Recommended for fat-burning weight loss and increased energy. Combination of MIC with Vitamin B12 Shot. B Slim Shot: Lipotropic MICA with Vit. B12 & L-Carnitine: Recommended for the benefits of the B Shot with the addition of more lipotropic (fat burning) properties. Benefits: Weight loss, increased energy, detoxifies, hormone health, elevates mood, promotes better sleep, reduces hangover symptoms, and boosts your immune system. B Ageless Shot: Vitamin B12 with Biotin: Recommended to reverse/ slow down signs of aging process & anti-oxidant. Benefits: Minimizes fine lines and wrinkles, rejuvenates the skin and body, and improves stamina. Eliminates toxins, detoxifies heavy metals, enhance immune system function. B Vanity Shot: MICA Shot, Glutathione, Phosphatidylcholine: Recommended for beautiful, healthy skin, nails and hair. Weight loss, immune boost, and fat loss. Benefits: rejuvenation of skin, hair, and nails. Helps with weight loss by burning fat and calories. B Weight Loss Kick-Start Shot: MICA & Vitamin B & Chromium: Recommended for kick-start on your weight loss with Dr. Cho's customized weight loss plan. Benefits: Increased sense of energy, a sense of wellbeing, immunity and appetite control. Glutathione Shot with Vitamin C Shot: Best combination for an anti-aging recipe for "Beyonce glow" and whitening property of skin & immunity boost. Vitamin D3 50000iu Shot: Master anti-aging shot with countless health benefits. Anti-inflammatory and Anti-Cancer prevention. CoQ10 20mg Shot: Recommended for an overall energy boost, anti-inflammatory, especially for heart function. Brighten your skin with this master antioxidant. Powerful, quick way to reset your body with energy and immunity. Ultra-high dose Vitamin C IV for immunity boost, fight infection and anti-aging for glowing skin. Calm over-firing adrenals and start recovery by nourishing your adrenal glands. Designed for pre-op and post-op to optimize healing and recovery. Designed to rekindle your passion and vitality. Ultimate way to detox from heavy metals and toxins. The master plan to calm, heal rejuvenate and revive your body in the most effective way.